The garter stitch bug has officially bitten. First, there was a hat. Now there’s half an EZ-style moebius scarf. I can’t waste an inch of this yarn. She just made it for me for no reason. :) There’s a sad, sad story behind this wool. I used to be able to get this Finn top that was just fantastic. Sarah and I were fools for it. The sheep only made that fabulous wool for one year, and then they went back to being more Finn-like (coarse). We are still sad. I bet there are some customers who remember it fondly, as well. Once I get some alone time, that hat will be seamed. I don’t think I’ve ever seamed garter before. I’m gonna have to look that up. I’ll post about the hat pattern, which I think is awesome, but totally confusing. Hopefully my thrashing about can save you some trouble. I’ve changed the way I do the dye kits. Now you can either purchase one with primary colors and black, or one with colors of your choice. 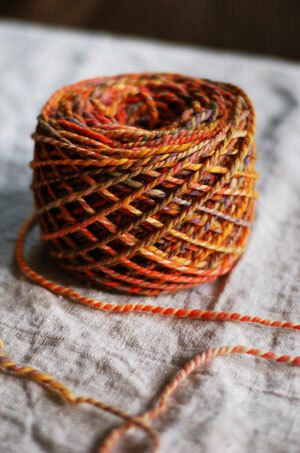 Un-dyed yarn and fiber can be purchased separately to be used with the kits. There have been some new additions, like Louet Gems yarns and superfine 18 micron Merino wool top. The softness, it will kill you. People, I’m taking a vacation. I haven’t been on one in 6 years. Both Mr. HelloYarn and I run our own businesses, so it’s not easy to get away. We’re taking advantage of a skilled house/dog/business-sitter and going to Ireland early next month. This sitter won’t be running Hello Yarn, though, so the shop will be open, but orders placed between the 4th and 13th won’t ship until I’m back. Cool? The next shop update will be after I’m back. Sorry! Has anyone been to the Sheep and Wool Centre in Galway? Was it good? It’s a bit of a hike, so I don’t want to haul my carcass up there if it’s a snoozefest. Now that that’s all out of the way, the most important thing of all must be dealt with. What will I knit on that long plane ride?? The best result I’ve ever had with seaming garter stitch was to do it with a crochet hook- strong, yet flexible and blended nicely. Have an absolutely fabulous trip! Adrian, good for you…have a great trip. My husband is in Ireland right now golfing. They’re having some nice weather there right now. I’ll miss your updates but will wait patiently for your return. Have a wonderful trip, pretty girl. Take lots of pictures for us! I read your blog daily, well, every day that there is a new post. :) And I have added your link to my blog so all my “regular readers” can visit you as well. Thanks for such good stuff. I cannot wait to see what you do, see and find in Ireland. What an awesome vacation. Enjoy!!!! Ohh Ireland! That will be lovely and such a great tiem of the year to go. Ireland sounds lovely. Go enjoy yourself! The yarn is lovely. I’m a total sucker for rusty colors. Really yoink on that first stitch, it likes to stay loose and hang down over your eyebrow like a little loopy eyepatch. EZ outlines the garter graft in the “Weaving and Blanket” chapter of Almanac but its not grafted ‘off the needles’ so its hard to follow. I love those! 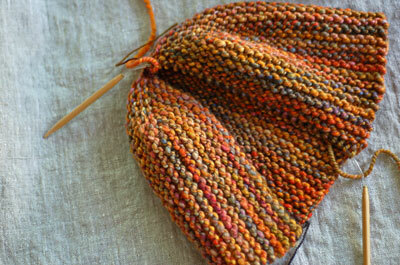 The garter stitch really brings out the great colorway and texture of the yarn. I’m so jealous! I hope you have an absolutely amazing time on your vacation! I know you just made a baby surprise jacket, but have you seen the modified wrap pattern in the Spring/Summer issue of Vouge Knitting? The only other thing I can say is, being the huge dork that I am, I would probably knit something either oragne, white, or green in honor of the Irish flag. Ireland! Wow, I wish.. I would love to go there one day. Have fun for me! 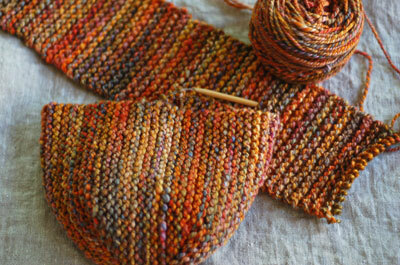 Please, keep the garter stitch obsession alive! I have just loved seeing your handspun in such beautiful, simple, delightful handknits. Thanks, and have a wonderful vacation! vacation- fab!!! and yes, you must knit this lovely yarn to the last inch! Oh, you lucky duck. I wish I could come with you. My hubby lived in Ireland last year and has a friend that is from Galway, so I will have him check into the museum as we have not been there ourselves. The hubby scoured the whole city and this was the only place he could find 100% Irish wool. Can’t wait to hear about your vacation! Good for you for finally taking one. I saw a comment on grafting in garter. It’s, like, so much easier than regular grafting because it’s the same motion on both top and bottom needles. I must have used EZ’s directions in Knitting Without Tears to graft the top of my tomten. Oh, and socks sound like good airplane knitting to me. But of course you’ll have to take at least a few different projects. You never know. Oj, I love Ireland, the rolling green hills, the friendly people and the Guiness, which tastes so good over there. Have a great vacation. As for knitting on the flight – SOCKS! I have been a long-time reader of your blog and I love it. My husband and I had our honeymoon in Ireland for 2.5 weeks! It was the best time! You need to stay with Mary and Tom MacDonald in Kilgarvin, Co. Clare (near the town on Kenmare). They are the most gracious hosts and she is the best cook in all of Ireland. (trust me you get sick of the traditional Irish Breakfast) Please feel free to email me with any questions that you might have! I am happy to share them with you. (and go to the woollen mills!) You deserve a great vacation! with pretty yarn like that all you need is garter stitch! PS. Have a great on your vacation! I totally missed that. Travel safe and come home back home with a smile. Go! Just GO! Don’t worry about anything back here. Hooray for you two taking this time together away. So exciting! And that hat, that yarn, is incredible. So, maybe you could tell us more about why that particular fiber was so amazing only that one single year? Or, if there’s no explanation as to WHY it was different, WHAT about it is different? Just curious. I hope you have a really nice and definitly deserving vacation! I have been to Dublin and it was great. It is like a miniature of London, and everything is walking distance. A little tip for knitting on the plane: Check in forhand that it is allowed. Evidently are knitting needles considered a possible weapon and therefore banned from some airlines. good for you taking time off! we’ll all be here when you get back. oh awesome for you and Mr Hello Yarn for your vacation! I’m in dreadful need of one myself (as is Mr Woodlandsprite :P) Surprisingly I didn’t see much in the way of yarn shops in Ireland when I was there – I think I had just started knitting back then, but I don’t remember exactly – funny how the brain works that way. I have received gifts of yarn from folk who go to Ireland and I got a whole bag of Aran yarn that is in my Ravelry Stash if you care to look – or in the Yarns section in Ravelry – look for Kilcarra Aran Tweed. No idea where it can be purchased, but I know it was obtained in Ireland. Have a glorious time! I love how your hat and scarf turned out! Also, I am STILL mourning that Finn. The second you told me the glory days were over, I tucked away what little bit I had left for a special project someday.